This machine is special since this black variant wasn’t sold in the US. 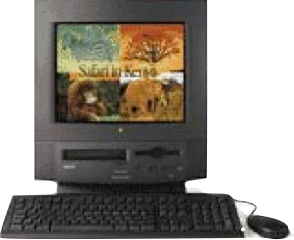 Otherwise it continues the idea with an all-in-one computer with its integrated color monitor and CD-ROM (much like the later iMacs). Unfortunately this one came with only 16MB which makes it quite unusable and also meaning it’s stuck with Mac OS 7. Even worse is that it’s using some kind of odd memory standard hard to find.